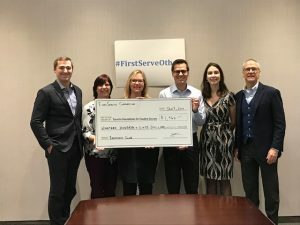 At FirstService’s Toronto office, the Social Responsibility Committee is always looking for ways the team can positively impact its community. Child poverty is a growing problem, and many children do not receive adequate nutrition as a result. Through a series of “Breakfast Club” fundraisers, the team raised $1,960 to fund Student Nutrition Programs in the Toronto area. For every $100 raised, 70 children will receive a hot and healthy breakfast. 100% of the donations collected by the team went directly into these programs.